This seminar is a culmination of Baba Obafemi Origunwa's most powerful foundational teachings. Let's take a journey through the four regions of physical, ancestral, communal, and spiritual energies, where you will encounter the direction and insights needed to take your spiritual practice to the next level. 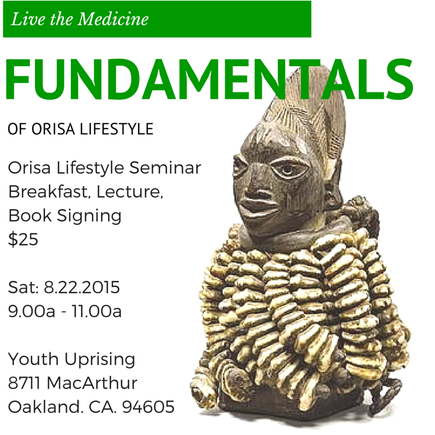 With instruction inspired by Baba Obafemi's most ground breaking book, the Fundamentals of Orisa Lifestyle, the Orisa Lifestyle seminar is designed for individuals who are ready to streamline their spiritual development. What is the role of the physical body in your spiritual practice? Who exactly are the ancestors? What is the TRUE purpose of initiation? Who are you? Where are you REALLY from? Why are you here on Earth? If you're ready to clear out the clutter and haziness of your spiritual practices, this is the seminar for you. What is your divine purpose here on Earth? What is the role of Ancestors? What is the true meaning of destiny? What is Orisa and what is their function? What is the purpose of initiation? There is a path that the soul takes from one generation to the next. Likewise, each family lineage represents the embodiment of the soul's journey as it seeks to complete its sacred mission. In this journey, you have been called to make a meaningful contribution to the world, according to your family's unique mission. In this regard, the truth and beauty of your personal destiny is marked from the beginning and the critical events of your life - your cohort of friends, love interests, educational pursuits, legal battles, illnesses and losses - conspire to activate your natural gifts and talents and enable you to express something that only you can bring into the world. Each step you take upon the predestined pathway of the soul can bring healing and understanding to you and those were born to serve, no matter what mistakes you have made, no matter what limitations you have placed upon yourself or have been placed upon you by others. in other people’s lives gathered together. They then went to Òrunmìlà. They said “Coming back and forth to earth tires us, Òrunmìlà. As we face the storms of change and tragedy that increasingly characterize contemporary life, we desperately need places of refuge. One of the first places to look for refuge is deep inside yourself. This is not a call to rugged individualism, however. You were not born alone. You do not live alone. You do not make the journey of life alone. Countless thousands of supporters have gone before you, accompany you in this very moment and will follow the path that you establish in your lifetime. As you learn to follow the subtle rope of life, that links you to your infinite resources, you move closer to the places of deep unity and harmony that are part of your inner nature and secretly part of the natural world as well. Amidst the chaos of a world gone terribly wrong you can still find the harmony and rhythm of the body, as well as the song within your soul that will help to bring about the Good Condition. In the depths of your soul a spark of vitality and creativity is waiting to be awakened. As you learn to increase your connection to this inner spark, you will be pleased to encounter the intermediaries of the soul, those unexpected guides and teachers, the faithful friends and healers, the animal totems and spiritual cohort who have been sent awaken you to a greater sense of your true identity. You are eniyan, the chosen ones, who have been specially selected by Olódùmarè, the Supreme Being, to bring about theGood Condition. Join us on this path of discovery as we live the medicine that will heal our lives and heal the lives of those we are destined to serve.